When Erik and first started looking at houses I really wanted one with a bay window. Luckily we found our house and it had a bay window. What I didn't know is that bay window rods are expensive! After a year and a half of living in our house I decided it was time to figure out what to do. That's when I decided to make my own. Measure your bay window and decide how long you would like your curtain rod to be. My local home improvement store only had a ten foot pipe which was a little over what we needed. Luckily my handy man husband had a pipe cutter and cut it down to the right size for me. I am sure you could have them do this for you in store as well. I chose a 3/4 inch round pipe which was the smallest size available at the store. You can go bigger if you would like just know it might be hard to find brackets that fit a larger pipe. 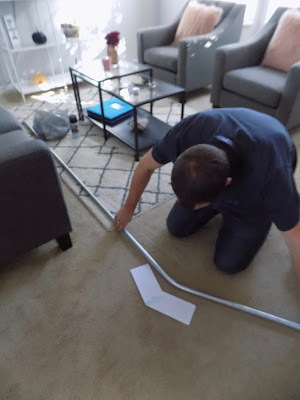 Mark where you want your curtain rod to bend. Recreate the angle of your bay window. We used two sheets of paper from a note pad and a thumb tack. Place your angle guide next to the pipe and bend where you have marked the angles to go. I stood on the pipe while Erik bent it into shape. Once you have your curtain rod the way you would like it place the pipe plugs on either end of the curtain rod. You can also purchase curtain rod ends from the store and add them. 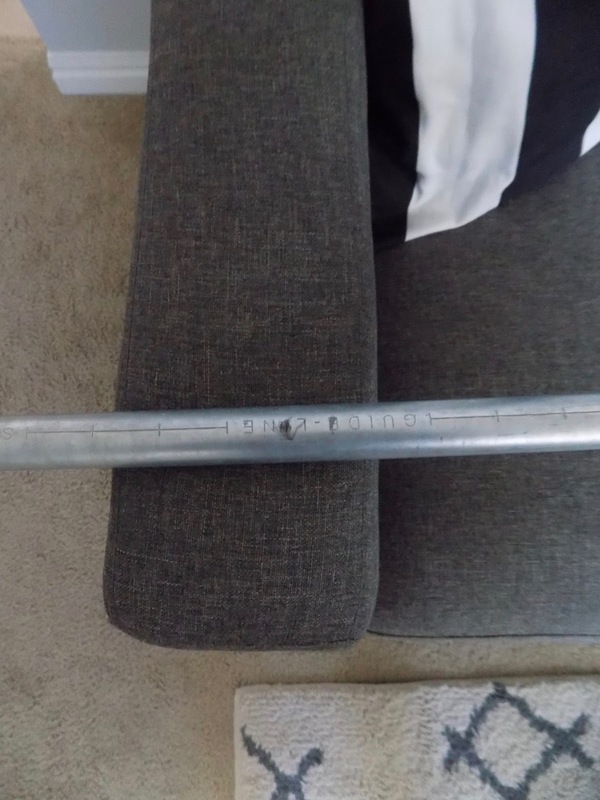 I was going for a cheap curtain rod and wanted a flat end so I figured this would do. Spray paint the pipe your desired color. We went with black to match the rest of the living room's hardware and a satin finish so that it wasn't dull but also wan't too shiny. While the pipe drys hang your brackets. Two at the outer ends of the bay window and two at the corners of the larger window. We placed them at the height we preferred. The brackets were for a 3/4 curtain rod but were just a little too tight on our pipe as the 3/4 measurement is for the inner part of the pipe. We bent the brackets with a plier a few centimeters more and it worked perfectly. Once the pipe is dry place it along the brackets and hang your curtains! Altogether it cost under $30! I will take that over $70 any day. 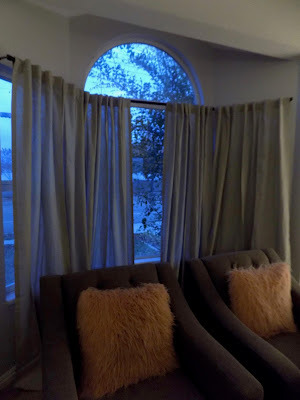 Now that we have the bay window curtains up the room is officially done! Do you prefer to save money and DIY? Or would you rather save the time and spend the money?